British Columbia, Canada not only offers breathtaking wilderness regions, but it’s home to abundant wildlife. Just some of the magnificent creatures you may be able to glimpse include grizzly and black bears, mountain goats, moose, bighorn sheep, cougars, deer, wolves, marmots, countless bird species and an array of marine life, including sea lions, dolphins and whales. These wildlife encounters are just about guaranteed to make for an unforgettable holiday in Canada’s westernmost providence. 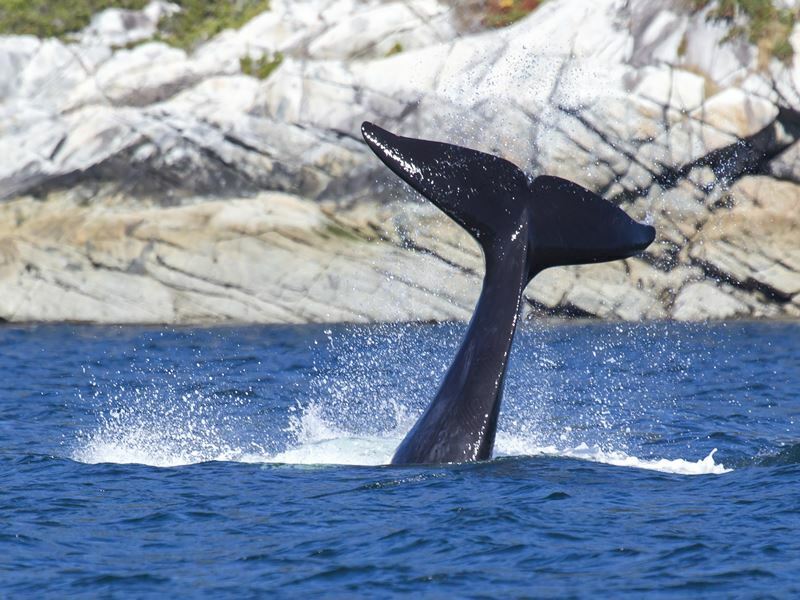 Throughout Vancouver Island you’ll have a wealth of options for whale watching tours, including right from the beautiful capital city of Victoria. 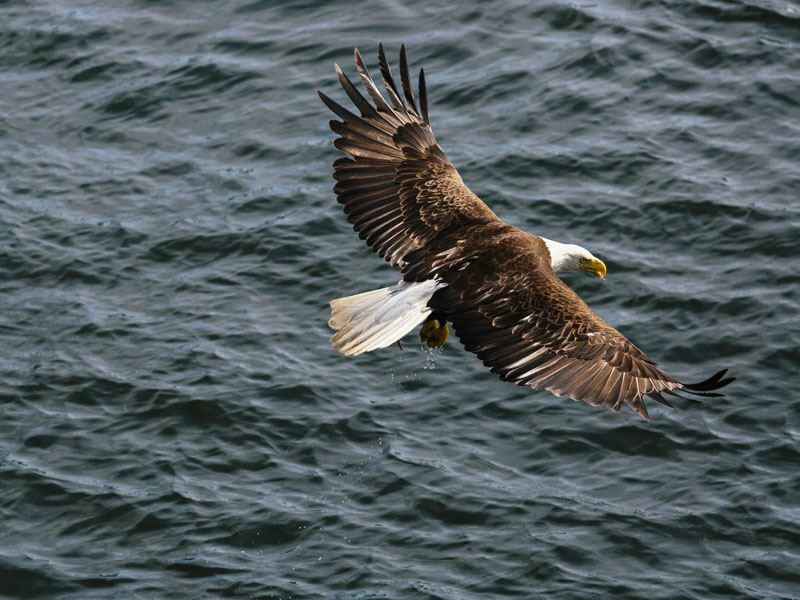 Eagle Wing Tours is a top pick for viewing animals like minke, orca, humpback and grey whales. From mid-May through late-October sightings are guaranteed the creatures are found in such abundance. For a more intimate experience, join a kayaking tour, with half-day, full-day and even multi-day trips available. One of the world’s best destinations for viewing orca whales is in Johnstone Strait, which lies between northern Vancouver Island and the mainland. Some 250 resident orcas inhabit this area, and there is nothing like viewing these amazing creatures in their natural habitat. Truly magical, just imagine paddling alongside an orca, or watching one leap from the water just meters from your kayak. Along the way, you’ll not only see these whales but you’re likely to glimpse acrobatic Pacific white-sided dolphins, sea lions, otters and the gentle but massive humpbacks. 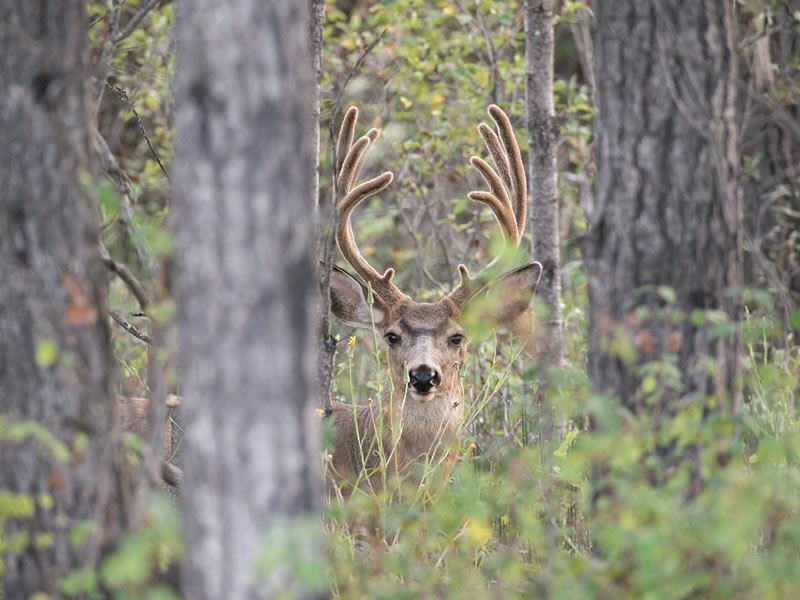 For the ultimate experience in the great outdoors, book with an outfitter like Wildheart Adventures located in Telegraph Cove near the north end of the island. A multi-day trip allows participants to fall peacefully asleep to the sounds of the whales that pass alongside the shoreline with tents pitched on the beach. It includes especially tasty, fresh cuisine, like wild salmon that was just plucked from the frigid waters. All your kayaking gear is included, and you can rent camping equipment, which means avoiding the hassle of having to lug it onto your flight. If it’s bears and whales that you’re hoping to see, consider our self-drive Vancouver Island tour that includes the rare opportunity to marvel at bears in their natural habitat as well. The Great Bear Rainforest is a remote, unspoiled rainforest on northern Vancouver Island home to Great Bear Lodge. 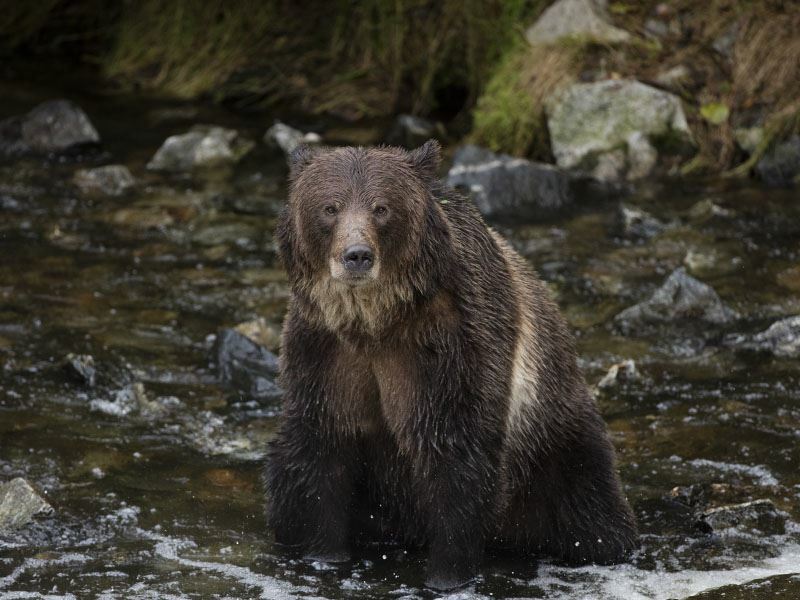 One of the top spots on the planet for viewing grizzly bears in a safe environment, it offers a wilderness retreat accessed by seaplane flight from Port Hardy. You’ll be led by expert biologist guides to experience close encounters with these animals and other native wildlife. A range of tours can be taken, including two grizzly bear-viewing sessions each day, as well as interpretive walks, boat excursions and other guided activities. Afterward, look forward to feeding your appetite with gourmet cuisine, including dishes utilizing high quality local and organic ingredients whenever possible. Spirit Bear Lodge offers an especially unique experience. 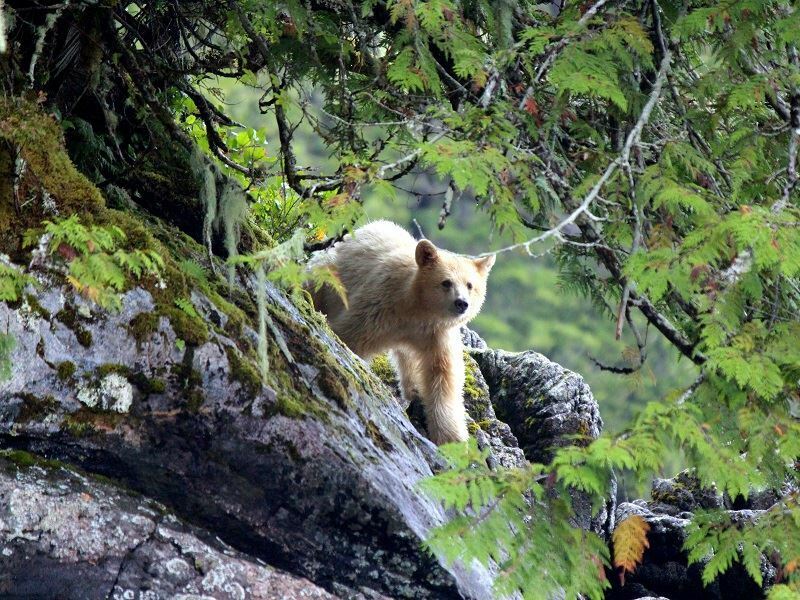 The rare spirit bear, also called the Kermode bear, is one of the world’s most elusive animals. To view these black bears that have a cream-coloured coat, it takes the tracking skills of an expert guide along with plenty of patience and good luck. There are less than 400 spirit bears on the planet today, and they’re only found here in the Great Bear Forest. If luck is on your side and you’re able to see one, it may be a sign of good fortune to come as the First Nations people believe. A stay at this lodge allows you not only this opportunity, but to immerse yourself in First Nations culture and take tours of their ancestral lands. Along the way, in addition to bears, you might catch glimpses of mountain goats, wolves, cougars, Sitka deer, humpback and orca whales, sea otters, sea lions and more. What better way to immerse yourself in nature and view wildlife than on horseback. 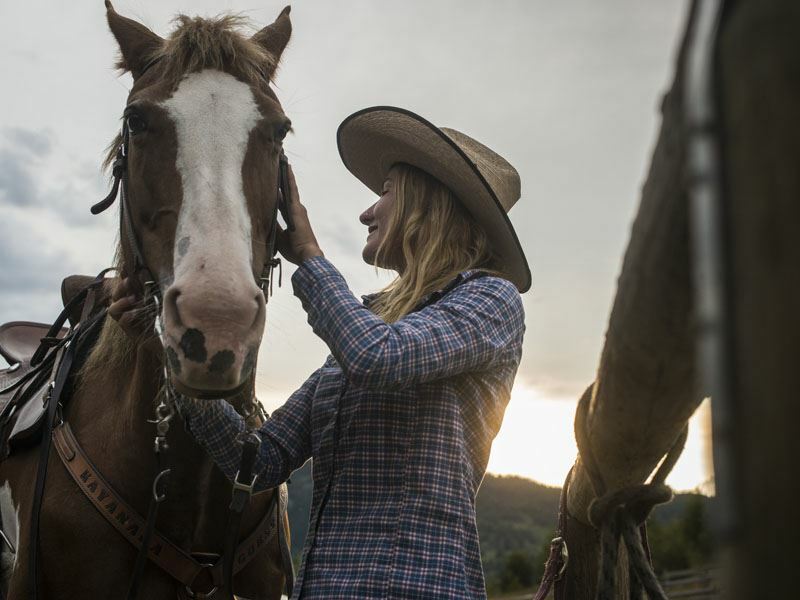 Surrounded by stunning natural terrain in the heart of ranching country in British Columbia’s Okanagan region, Campbell Hills Guest Ranch, you’ll be able to ride while watching for moose, deer, bald eagles, black bears, coyotes, cougars and a host of bird species. Clip-clop through mountain terrain and lush alpine meadows with horses and rides customized for all levels of riders, walking, trotting and cantering for longer periods that suit the abilities of each person. Other activities are available as well, like fishing, wagon rides, mountain biking, hiking, four-wheeling and even kayaking. The ranch sits across 160 acres, with mapped and marked trails offering some of British Columbia’s most awe-inspiring vistas. On a warm summer’s day, you can paddle out onto Campbell Lake, relaxing and enjoying excellent bird watching too. While Whistler may best be known as a winter ski resort, viewing the area’s black bears is one top draws between mid-March and October. There are several ways to view them safely, including from above via the gondola on Blackcomb or Whistler mountains. Of course, it also provides an awe-inspiring bird’s-eye perspective of the dramatic mountain scenery too. 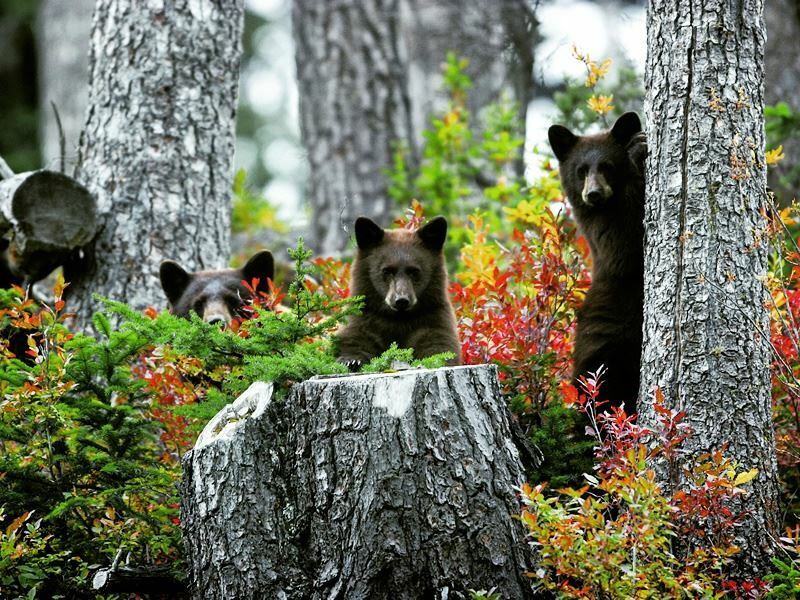 Sightings are reported every day during this period, with mother bears and the cubs gorging on the berry bushes, frequently near the ski-out area from the Creekside gondola. Another option is to join a Great Whistler Bear tour. Researcher Michael Allen offers these expert-led tours in a 4 X 4, visiting active bear dens, feeding sites and other areas frequented by the animals. It’s a different experience depending on the time of year. For example, from mid-May to mid-July, you may see the adult males searching for mates while families are busy getting fat on the berries. They indulge in both berries and ants the following month, and then from mid-August to mid-October, fattening up on the berries that grow in high elevations. It’s a great way to see mothers and their new cubs that are often glimpsed around Whistler Blackcomb. If you happen to arrive in the spring, you may even spot some of the animals around Whistler Golf Club. While they aren’t going to be attempting a hole-in-one, you’ll see them dining on skunk cabbage on the nearby Valley Trail. Bears tend to hang out right on the Chateau Whistler Golf Course too. Nestled in the picturesque Discover Islands archipelago, Sonora Island is surrounded by some of Canada’s most pristine environments and is home to Sonora Resort, one of the most luxurious ways to experience the wilds of British Columbia and the animals that inhabit the region. You’ll be steps away from postcard-perfect beaches, scenic trails and the opportunity to get out and view marine mammals like seals, sea lions, dolphins, porpoise and whales. While the resort offers a wide range of activities and wildlife-watching options, it’s arguably most famous for its grizzly bear tours, including the opportunity to join a boat excursion through Bute Inlet to witness grizzlies up close in their natural habitat as they hunt for salmon, accompanied by a First Nations guide from late August to October. Just as impressive may be the hundreds of bald eagles that can often be seen circling the skies and diving down to the water to catch a meal. When you aren’t picking your jaw up off the floor marveling at the many creatures here, you can enjoy all sorts of resort luxuries. There are fly-fishing ponds, a swimming pool, a mouth-watering menu to dine on and a wide variety of pampering treatments at the property’s Island Currents Spa. Around 50 to 60,000 wolves inhabit Canada, the world’s second largest population after the former Soviet Union, and one of the best ways for a face-to-face encounter with these beautiful animals, and come away unharmed, is at the Northern Lights Wolf Centre. Located near the border of Yoho National Park, it offers public tours to see them, including a special photography tour where you can walk with the wolves and potentially capture some once-in-a-lifetime shots as they roam freely around you as if you were a member of the pack. You’ll journey through the wilderness, surrounded by jagged mountain peaks, with qualified wolf handlers nearby to ensure safe encounters. While the centre is open year-round, the spring, summer and fall months are best as you’ll be able to take part in more interactive experiences and even get to enjoy mouth-watering BBQ too. The bird watching opportunities in B.C. are practically endless. On Vancouver Island alone, there are over 220 different species, from trumpeter swans, brant geese and bald eagles to owls, songbirds and everything in between. At Goldstream Provincial Park, bald eagles are just one of the highlights, sharing the trees and skies with kinglets, Steller’s jays, red-breasted sapsuckers and many others. You can also see the park’s own version of Niagara Falls, an impressive waterfall that plunges more than 150 feet. If you’re looking for a convenient, guaranteed sighting of many of the province’s native land animals, head to British Columbia Wildlife Park in Kamloops. 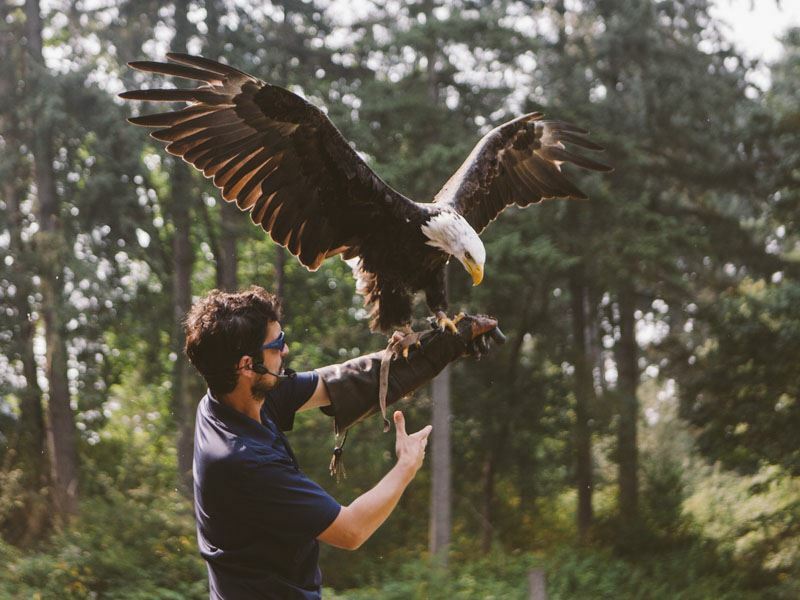 Here you’ll be able to enjoy close encounters with all sorts of wildlife, including the rare spirit bear, grizzly and black bears, birds of prey, Rocky Mountain bighorn sheep, cougar, lynx, elk, Arctic wolf and moose. In total, the park is home to some 40 different animal species. You can get so close you may even hear the hiss of a bobcat.